The Sunshine Dress pattern by Sew Me a Garden is available as an instant download from Etsy. Purchase the Sunshine Dress pattern for $9.95 on Etsy. The Sunshine Dress pattern by Sew Me a Garden is a 21 page PDF document that includes detailed instructions, pictures, and pattern pieces. The instructions will guide you through making a little girl's long or short sleeved Sunshine Dress in sizes 2-8. The pattern pieces print on regular 8.5" x 11" printer paper and are marked for very easy assembly (just tape together to make the full pattern pieces). Sunshine Dresses are fun and easy to make, the pattern is suitable for both beginner and experienced seamstresses. There are many tips and variations included in the pattern. Dresses made using this pattern can be sold in your own shop. Please credit Sew Me a Garden in your item description, such as "This dress was made using the Sunshine Dress pattern from SewMeAGarden.com." The Sunshine Dress can be sewn entirely with a sewing machine. A serger and/or coverstitch machine can be used for seams and hems if desired. 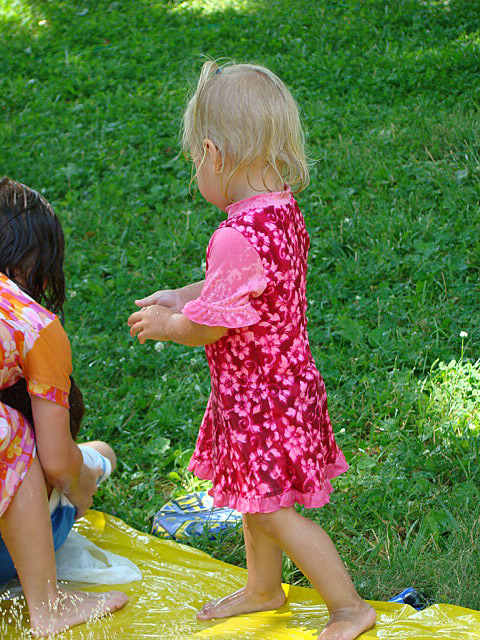 Use the Sunshine Dress pattern to make a cute and sun-protecting swimsuit! Use swimsuit material or polyester/lycra/spandex. Add some ruffles! A big thank you to Bekah for letting me use her adorable photo!